The Rafale Issue: Why did Dassault Aviation invest in a Debt-ridden, inactive Anil Ambani company? The Rafale story is taking a lot of twists and turns each day. While there are many allegations surrounding this whole issue, still no official clarifying answer has been provided by the government itself on this sensitive issue. Things are being taken for granted, by the ruling party and of course the honorable Prime Minister, Mr. Narendra Modi. And now, there’s a dire need to throw some light on this. And a serious revelation has indeed been made by The Wire, just recently, regarding the Rafale deal and the entire matter. 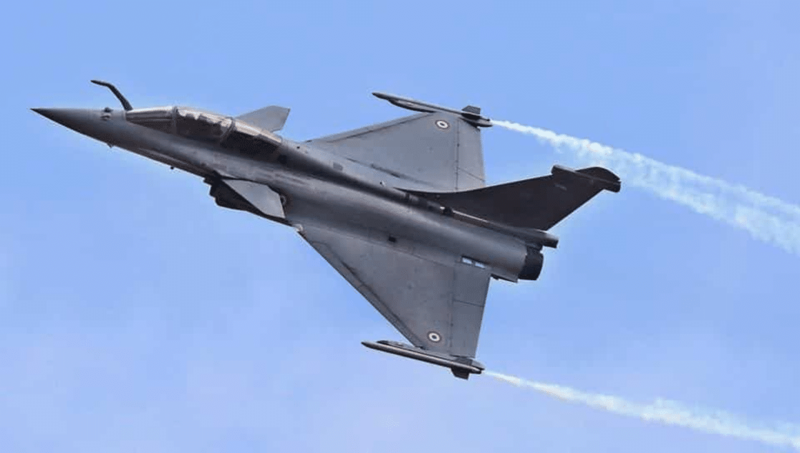 The French defence major, Dassault Aviation and Anil Ambani’s Reliance group are fighting the allegations made against them, that ‘extra-commercial considerations’ were the reasons behind their joint venture on Rafale. But the regulatory filings in France and India have now revealed that the French defence major followed its Joint Venture with an investment in 2017 of around 40 million euros in another Anil Ambani venture, which is ‘loss making’ and has in fact ‘zero revenues’. This investment made by Dassault translated to around Rs.284 crore profit for that Anil Ambani group company, called Reliance Infrastructure, which sold its shares in another subsidiary, called Reliance Airport Developers Limited (RADL) at a premium. Obviously, it becomes really mind-scratching how the valuation for RADL stake was reached between the two groups (that is Dassault & Reliance). Or putting it more straightly, the big question that arises now is that, why did Dassault Aviation invest in an unlisted company that has little to no revenues and why would it buy a substantial share in a debt ridden company like this, which has nothing to do with what Dassault does, at its core, that is manufacturing? Coming onto the details, then the public filings by Reliance Infrastructure, a Reliance ADAG (Anil Dhirubhai Ambani) group company, show that it sold a 34.7% stake in RADL, a wholly owned subsidiary, to Dassault Aviation in the financial year of 2017-18. But interesting thing is that the terms of this sale are not known, and also that Reliance said that it made a profit Rs.284.19 crore on the sale of its 24,83,923 shares, having a face value of Rs.10 each. And not only this, the Reliance Airport Developers in fact posted losses of Rs.10.35 lakh for the financial year ending March 2017. And when it comes to revenues, it just earned Rs.6 lakh! Adding to that, the company had no revenues and posted losses of Rs.9 lakh, for the year ending in March 2016. The subsidiaries in which the company has stakes, which the group owns, are also loss making. Airport projects were given to them by Maharashtra government in 2009 for Rs.63 crore. According to a report by Business Standard, in October 2015, government officials and ministers said that due to the lack of progress in developing these projects by the company (RADL), a decision was taken to take back the airports. Also, the company too wasn’t interested in these stakes and in fact wanted to get rid of these stakes in those airports, but a news report from Januray 2017, showed that it ‘suddenly’ changed its mind. And now comes the twist in the tale. The Maharashtra Airport Development Council (MADC), which was preparing to literally take back the charge of the airports after dissatisfaction with RADL’s progress on the project, somehow, and very rapidly, allotted 289 acres of its land to another group (of Anil Ambani’s Reliance itself), in that same year! And the acquisition details of Dassault Aviation’s annual report of 2017 mention that the French firm acquired some ‘non-listed securities’, including a 34.7% equity participation in Reliance Airport Developers. The report of Dassault said, on its behalf, that they strengthened their presence in India through an acquisition of a 35% stake in Reliance Airport Developers Limited, which operates in the management and development of airport infrastructures. Strange. 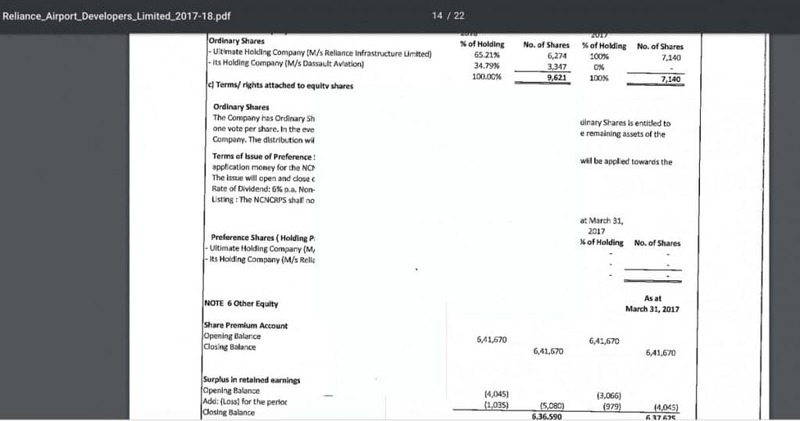 Very surprisingly, the annual report of Reliance Airports, posted on the site of Reliance Infrastructure, notes that Dassault Aviation now holds 34.79% of ordinary shares but when it comes to explaining the terms and rights related to the equity shares, there are no details, and in fact have been blanked out. Below is the screenshot of the annual report from the site of Reliance Infrastructures. You can see for yourself.